Scrapbook.com was privileged to host some of your absolute favorite American Crafts designers for a few days of fun, filming, and festivities for Creativation 2019. We showed them a good time in our beautiful home state of Arizona, and they showed off their amazing new collections! Join us for an exciting recap of their special visit to Scrapbook.com and get a sneak peek at some of their upcoming collections from Creativation 2019! American Crafts designers were greeted by Scrapbook.com’s amazing, bright sign upon arriving. Everyone on the Scrapbook.com team was buzzing with excitement to host some of the most brilliant, creative minds in the crafting industry. Our halls were filled with Vicki Boutin’s laughter, Heidi Swapp’s heartfelt stories, and more smiles than we could count. We were truly humbled to be in the presence of so many wonderful, inspiring women! 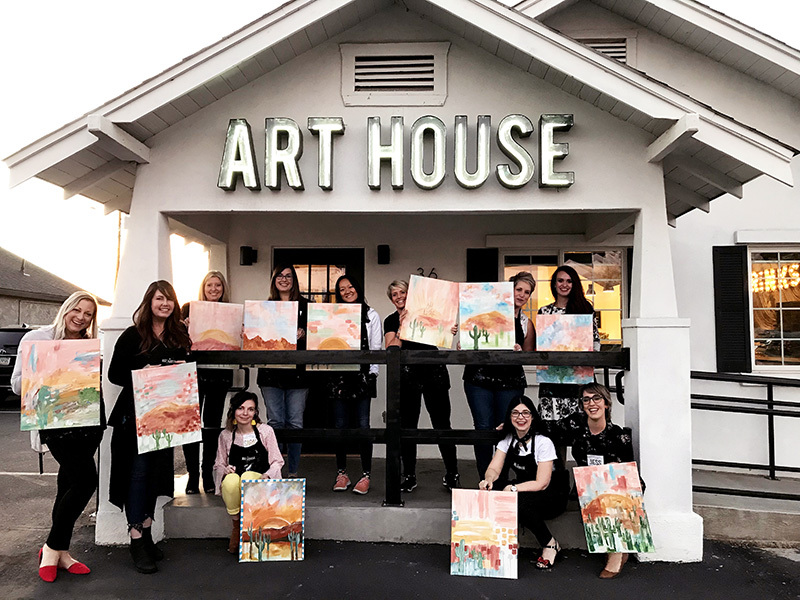 Because our friends at American Crafts don’t do enough artsy activities in their daily lives, we decided to take them out for a paint night escapade! The instructor at The Art House in Downtown Gilbert was a good sport when Vicki Boutin inquired why they weren’t using Vicki Boutin brushes from her All the Good Things Collection. Guess it’s BYOB (bring your own brushes – literally!) or use what they give you, Vicki! Vicki Boutin was taking the paint project very seriously at The Art House! Some of our Scrapbook.com team members were up to the challenge of creating artwork side by side with some seriously crafty designers. Speaking of serious, Jen Hadfield was in the zone concentrating on her brush strokes! The stakes were high in a project that involved an artful Arizona landscape. Where some people painted pretty and prickly cacti against a gorgeous sunset, others painted what they called “dancing pickles”. There were a few grumbles when Kelly and the rest of the designers had to settle for signing their works of art with a Sharpie as opposed to a signature Kelly Creates pen or marker. We don’t blame them – we love Kelly’s pens! A Heidi Swapp masterpiece with a wonderful, inspirational message. This activity definitely demonstrated the versatility and points of view while creating a work of art. There was no right way to create, as our American Crafts friends often say. Each representation and vision was different, but created an amazing finished product! We think each and every painting came out uniquely beautiful! The verdict is…American Crafts designers and Scrapbook.com team members are all extremely talented! Let’s meet some of the lovely ladies from American Crafts that joined us at Scrapbook.com for a little bit of fun and a lot of creativity. Who is Shimelle? She’s a blogger, crafter, teacher, scrapbooker, and has been designing super creative collections for American Crafts since 2014. Shimelle bases her collections on a special moment, story or memory from her own adventures, which makes them even more entrancing! Shimelle puts the ‘sparkle’ and the ‘city’ in Sparkle City at this year’s Creativation! After her wildly successful Glitter Girl Collection and her recent release of Head in the Clouds, Shimelle dives back into a fanciful and fun fictitious world for her new line called Sparkle City! Shimelle gave us the inside scoop on this adventurous collection. “Sparkle City is inspired by how everyone can truly be a super hero in their everyday lives.” This wonderful and bright collection lets you dazzle, shimmer, and shine not only in your finished projects, but in your exploration of this unbelievable line. We were starstruck by the rainbow shimmer in Shimelle’s Sparkle City Thickers. There’s just enough sparkle and pizzazz in the stickers, accents, and papers in her new collection. Keep a close eye on our Coming Soon section for Shimelle’s Sparkle City, which should be coming our way soon! We are absolutely loving this rule of thumb when it comes to measuring how much paper is too much. Wait here while we go buy some massively high shoes…or find taller friends. Kelly is a brilliant teacher, writer, and designer behind the gorgeous Kelly Creates line of products for American Crafts! What started as a love of scrapbooks, teaching, and sharing handmade projects developed into a fascination with brush lettering and teaching others about this wonderful art form. Kelly reminds us to breathe, write, and relax at Creativation! Kelly’s writing utensils, workbooks, stamps and more are now breathing new life into modern calligraphy and brush lettering! Kelly told us the two items she could not live without in her craft space were her pens and paper. Then it’s no coincidence that this year she’s offering new pens, paper, and a whole lot more for you to learn, master, and incorporate beautiful brush lettering in your life! Coming your way soon! Kelly Creates is expanding her collection of popular Dream Pens and adding some amazing paper & Washi Tape! If you haven’t already heard the wonderful story about how Scrapbook.com played a role in the Kelly Creates name, check out our free class, Brush Lettering 101 with Kelly Creates! Fun Fact: Kelly has such a soothing, calm, relaxed demeanor that it’s not uncommon to find someone lulled to sleep while she’s teaching her brush lettering classes! She’s a teacher, designer, scrapbooker, wife and mother, who has spent many years traveling the globe. Fresh off her super bright and colorful Whimsical Collection for Pink Paislee, designer Paige Evans is unveiling another vibrant, remarkable adventure and travel-themed collection called Horizon! Paige is so bright and cheerful that she looks perfect in our video studio! This collection (her 7th one!) is a rainbow of colorful images and patterns, with a few adorable touches thrown in for good measure. Paige’s new collection is filled with colorful 12 x 12 papers that would make any scrapbook layout pop with a bright burst of beauty. There are little touches of whimsy like blooming florals and gorgeous birds, plus tons of different types of stickers. There’s even a pack of 2 x 2 paper pads that are too adorable to resist! Keep an eye on the Coming Soon section because this wonderful collection is on the horizon! Paige proudly posing in front of her new Horizon collection for Pink Paislee! Fun Fact: While filming a series of videos at Scrapbook.com, Paige told us that one of the elements on a layout she created took her 10 hours to complete! Instead of frustrated, Paige was totally relaxed and in the zone with creativity. She often listens to music or streams movies or TV shows to pass the time. From fashion designer to craft designer, Amy Tan, or Amy Tangerine as she’s fondly known, has traveled all over the world to teach about the joys of creating. Author of Craft a Life You Love (we are in love with the title! ), she teaches you how to focus creative energy and make small but meaningful changes in your life for positive results. Amy was all smiles in between filming in our video studio at Scrapbook.com! Amy’s favorite quote: The secret to life is knowing how to make the bad times good and the good times unforgettable. Amy’s newest collection for American Crafts, Stay Sweet, is filled with all the good things we love (not just yummy foods!). Hedgehogs, avocados, delicious popsicles and more accompany inspiring phrases to lift you up and inspire you every single day. We loved Amy’s super sweet fruit stand at Creativation! A project made by Amy Tan that shows us some serious love! Fun Fact: Amy has been known to document on-the-go in her traveler’s notebook, but life happens and plans change. It’s totally normal to have cross-outs and rewrites in your journal or notebook since there’s no such thing as perfect! Heidi Swapp is a memory keeper, storyteller, and maker of pretty things. She wholeheartedly believes that every moment can be a memory and those moments must be captured in a special way or they could be forgotten. Heidi strikes a pose after telling us all about her amazing new collections! In partnership with American Crafts, Heidi debuted not one but two amazing collections during her visit with us. Her first set of new products, the Color Fresh Collection, was inspired by her line of planners by the same name. “I loved the colors – the fun colors – and I just wanted more!” The collection itself is as fresh and colorful as the name implies with rad patterns, energetic stickers, and tons of planner accessories. We think Heidi’s fresh new collection has all the right colors! In contrast, Heidi’s Wolf Pack Collection is a darker, neutral-toned collection with a real earthy vibe. It speaks to courage and resiliency and being true to one’s pack. It’s an unbelievably unique collection that has stolen our hearts with its deep, inspiring message. Heidi’s Wolf Pack Collection is a heartfelt reminder to create special moments with your family. Words of Wisdom: Don’t put off doing things that will make you happy. Heidi detailed a wonderful day trip of hiking with her children and how touched she was to experience the beauty of nature and family. Make time for the things that matter most, take photos, print the photos, and document the memories! To learn more about family, parenting, loss, grief, strength and more, check out Heidi’s podcast, Light the Fight. Talented designer and mixed media magician, Vicki Boutin, was back at Scrapbook.com to inspire us and you with her new collection. From a background in graphic design (and dentistry! ), Vicki began taking pictures that developed into a hobby of scrapbooking to a career in crafting. We’re so lucky to have Vicki’s talent in the industry, and in our opinion, there’s far more rainbows and butterflies in papercrafts than dentistry! Vicki is showing us the magic of her new collection in the Scrapbook.com studio. Vicki Boutin’s collections and products have always been full of fun, sassy color, and her newest collection for American Crafts, Color Kaleidoscope, is definitely no exception! We couldn’t contain our excitement looking through the bouncy phrases on her Thickers, or flipping through the rainbow of eye-popping patterns in her paper pads inspired by “vibrant, rich, intense color!” She’s also bringing you some amazing new mixed media tools to make your projects better than you’ve ever imagined! So much fun color – it’s a kaleidoscope of magic! Maggie Holmes is a self-proclaimed “girly-girl” who turned a childhood of collecting stickers, erasers, and stationary into a career of collecting (and organizing!) stickers, papers, pens and more! Today she’s a photographer, designer, teacher, mom, wife, and scrapbooker that has designed some amazing collections for Crate Paper and American Crafts. Maggie joined us at Scrapbook.com to tell us about her heritage of scrapbooking and how it has made a true impact on who she is as a person and a crafter. If you all loved Maggie’s Flourish Collection, you’re sure to love Sunny Days! The sun seems to follow Maggie in her excitement and light, and this year she’s unveiling a new collection called Sunny Days. Filled with flowers, fruits, and fun in the sun, this super sunny collection is all about enjoying the warm seasons and living the sweet life. With foil-accented papers, acrylic paints, flirty and fun Washi tapes, shiny gems and accent flowers, this collection has Maggie written all over it! A sneak peek at Maggie’s Sunny Days Collection from Creativation. The wonderfully creative Jen Hadfield stopped by Scrapbook.com to enjoy the festivities and to tell us a little bit about her new collection! Jen, a blogger, designer, and creative mind behind some of your favorite Pebbles and American Crafts collections is all about seeing the endless possibilities in the things around us. Jen joined the Scrapbook.com team for dinner and told us all about her collection inspiration. Jen’s new collection, Chasing Adventure, is about enjoying the sights, sounds, and experiences on every road trip, vacation, or getaway. Filled with inspiring messages and women decked out in their traveling gear, this collection makes us want to get out and explore all the possibilities! Alongside these ladies are tropical foliage, suitcases, and cityscapes in 12 x 12 scrapbook paper, stickers, ephemera, boxed cards and so much more! Adventure awaits! These traveling ladies from Jen’s Chasing Adventures line make us want to pack our bags and explore! Fun Fact: Jen has a blended family and one of their biggest joys is traveling and experiencing things together. Chasing Adventures represents all the fun they have in their escapades together as one big happy family. Each of the talented designers left a mark on our hearts and our kraft paper wall. She’s a mom, a teacher, a designer, and a collector of vintage cameras. Elizabeth, or Dear Lizzy, as she’s affectionately known, is a wonderful collaborator with American Crafts. Even though she was unable to attend our event (and we really missed her! ), we couldn’t sing the praises of some of our favorite American Crafts designers without mentioning our dear friend, Dear Lizzy! Sunshine follows Dear Lizzy and her bright, cheerful collections! We’re still crushing on her New Day Collection, and now we have even more to be excited about! At this year’s Creativation, Dear Lizzy was showing off her newest collection, It’s All Good. A super colorful collection with a touch of Southern charm, full of sun, fruits, and so much fun! Watch the Coming Soon section for Dear Lizzy’s bright new collection for American Crafts! This collection is truly pretty as a peach! We want to thank all the wonderfully kind and talented designers with American Crafts for spending some time with Scrapbook.com and hope to see them all again very soon! What new American Crafts collection are you most excited about? Tell us in the comments below! And don’t forget to show your favorite designers some love on their social media channels!